"My personal understanding of each child’s needs has improved, which I feel is a direct result of the increased time I can spend with each student, as well as the data and video feedback I receive from eSpark." My school district’s partnership with eSpark Learning has enabled me to create a classroom where my kindergarten students are enthusiastic and engaged in exploratory, personalized learning with the iPad. 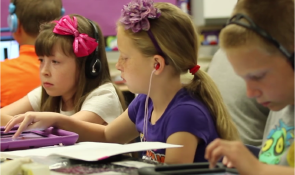 There are thousands of apps and instructional videos available online for creating personalized learning on the iPad. Given the large volume of available apps, it is important that teachers have resources available to them that can point them in the right direction for what can work best for their kids. eSpark does its homework by reviewing and compiling apps and instructional videos, which align with the Common Core Standards, that are designed to meet our needs. By choosing from the Core aligned eSpark selections, I can focus more efficiently on developing learning plans that are tailored to my individual student’s strengths and weaknesses. It has been very rewarding to observe how focused my students become when they are working with their apps at the iPad station. The eSpark app selections are very interactive, tactile, visual and enjoyable for the students. More importantly, many of the apps provide the student with immediate and constructive feedback. Such a response is difficult to achieve with traditional workstations.I love to see how eager my students are when they complete their challenges in a quest and are ready to make their own video. They often begin their video with, “I am going to teach you about…” My little five year olds become teachers and cannot wait to share what they have learned. It is amazing for me to see how five-year-olds are taking ownership of their education. For example, during a small group math lesson the other day, I had a student suggest that I use one of his eSpark instructional videos from his math quest to teach my math group about number bonding. He said he watched it several times and it really helped him “figure out number bonds.” He is only five, and he is already discovering how to use a visual tool to aid in his understanding of a concept. "It is amazing for me to see how five-year-olds are taking ownership of their education." Through eSpark, my students are more independently engrossed when they are at the iPad station working on their individualized app based curriculum. This allows me additional time to provide more in-depth differentiated small group instruction. My personal understanding of each child’s needs has improved, which I feel is a direct result of the increased time I can spend with each student, as well as the data and video feedback I receive from eSpark. All of the above has had a significant, positive impact on student achievement in my classroom, and I look forward to the continued evolution of the eSpark platform.